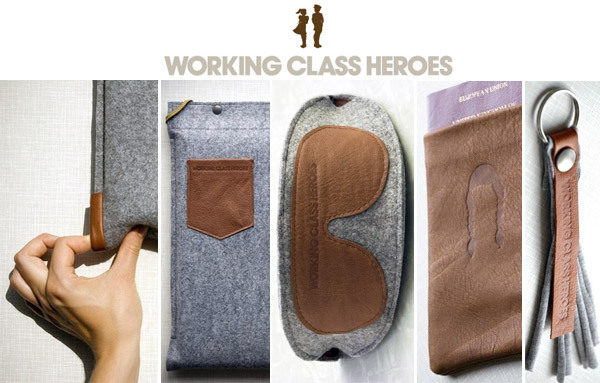 Working Class Heroes ~ this Viennese duo, Monie & James ~ have me giddy over their gorgeously functional grey felt and brown leather combinations… from laptop wallets to passport cases, moleskine pouches to glasses cases. 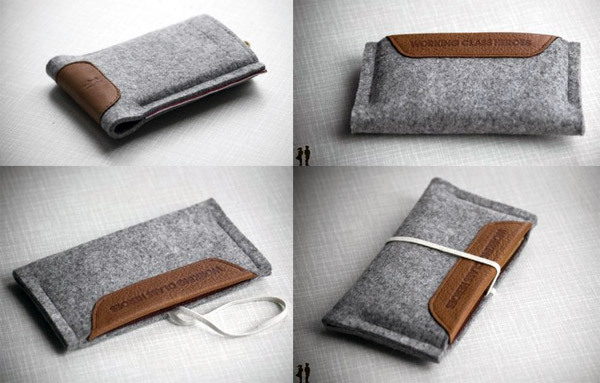 I mentioned these in a roundup where i had mentioned finding these on .org and ordering two laptop wallets! Well they arrived in LA while i’ve been in SF the last few weeks… and they were the first thing i headed for when i got home. First impression? Beautiful presentation, all hand tied with red/white ribbon, and the products are even nicer in person than online ~ and they were even nice enough to add one of their keyholders as well. 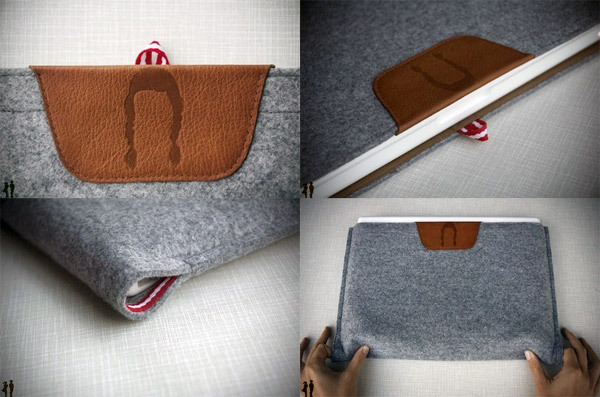 I purchased their Girls Only Laptop Wallet as well as the Laptop Wallet Tidy ~ and actually i ordered two simply because i couldn’t decide if i wanted it to horizontal or vertical, and at such a reasonable 49$ pricetag ~ no reason not to get both for use in various bags. 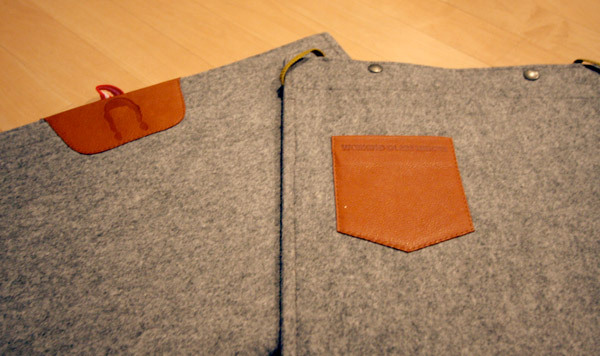 The three things about these that impress me most are… 1. no zippers! 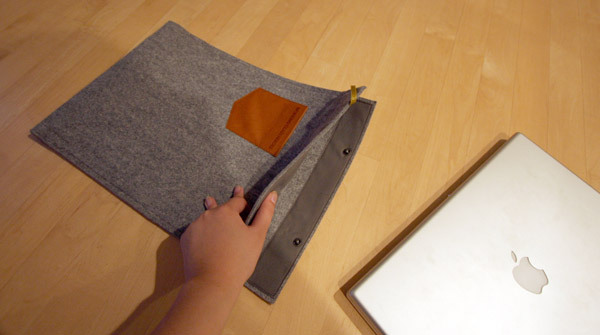 (i’m extremely particular about avoiding zippers in my laptop cases, because i had some macbooks get very sliced up on the sides from quick ins and outs… and also no velcro! 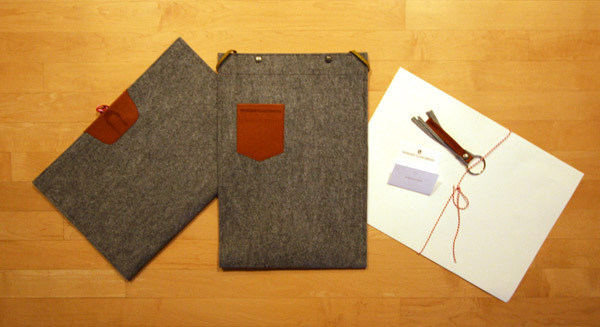 so its silent) 2. the simplicity of the styles using a nice heavy “3mm grey german felt” combined with adorable graphic branding imprinted leather accents ~ as well nice cotton herringbone reinforcements 3. the genius of having laptop sleeves where you can easily PUSH the laptop out. 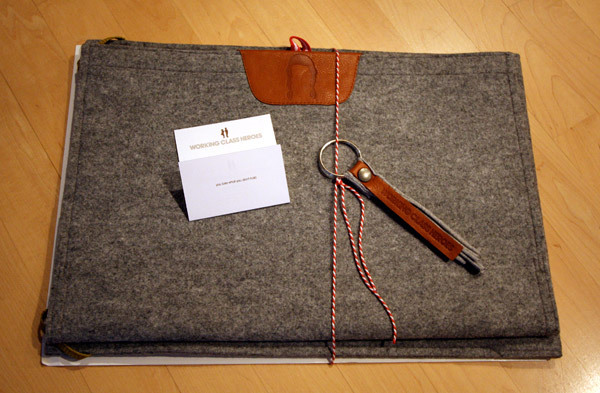 Honestly, i’ve gone through MANY laptops, laptop sleeves, and laptop bags ~ and its been a long time since i’ve gotten excited about one… but these have surpassed my expectations in both form and function. 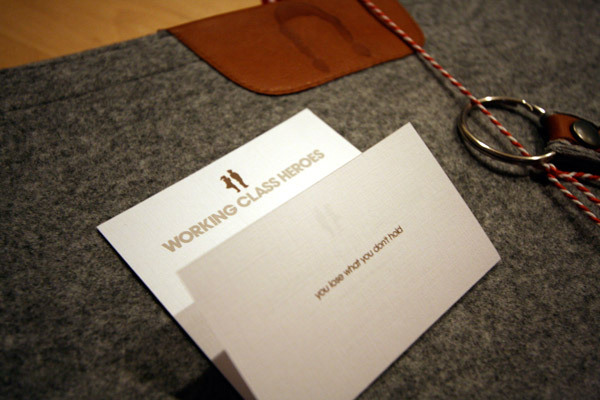 MANY pictures below, both from their site of their line, as well as some quick snapshots of mine when i just got home. Having these to play with may actually get me off my laptop a bit more since i need to close it to slip it into the laptop wallets! (see those finger holes at the bottom? they are genius! makes it so much easier to get the laptops out quickly… my airport trips will be much less of a hassle now… and less evil looks from those behind as i used to struggle with my last case. As for xmas presents for the iphone kids… dan was drooling over these a bit… so this has officially made the potential holiday shopping list ideas in the back of my mind… there are two models one vertical and one horizontal. 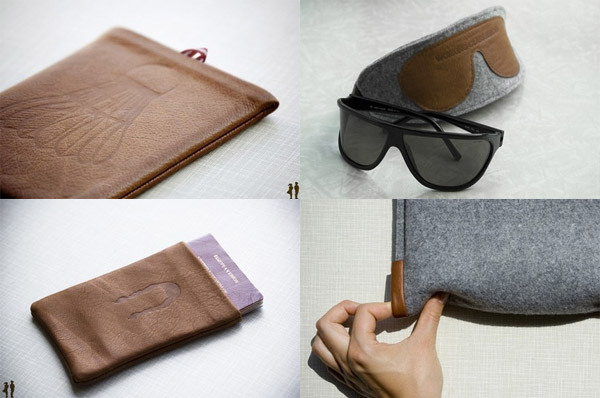 A few other products that looked fun ~ the sunglass case, the shuttlecock passport case, the girls only passport case… and a close up of the leather holes of the laptop loops sleeve. I know… not the best of pictures… but i just got into LA from a 5 hour drive… and i just couldn’t resist opening and playing with these when i got in, so snapped a few quick shots before untying it all… (the tied package was wrapped in foam and placed in a large mailer envelope from Austria. 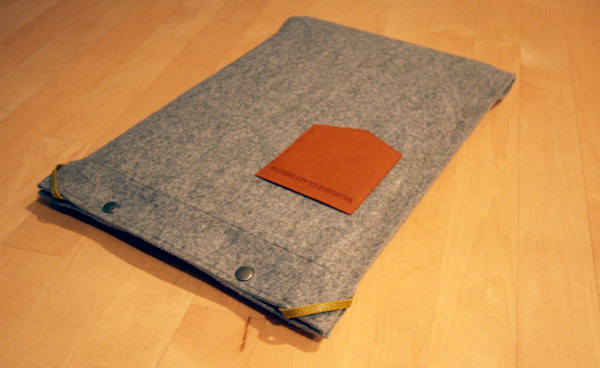 i also have a custom laptop sleeve from these guys. they were indeed very friendly and accomadating to my needs. oh, and they give you a delicious little treat too! 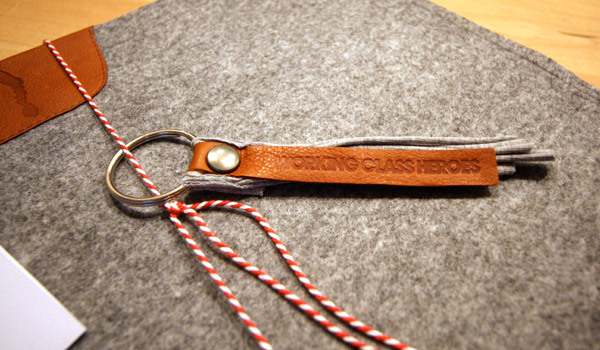 I have one of their leather key-pouches — it is a really nice piece of leather-work and an excellent solution to the problem of keys in your pocket poking into your leg.